Today I was shopping around for some things and I saw a very cool looking ravioli making machine. I had to work very hard on leaving the store without it, but in all truth, I just couldn't justify buying it since my kitchen is already overflowing with a ton of stuff I have, and I make fresh ravioli at least . . . uhm . . . never?! So I said to myself, let's try making them without the machine first, see how hard it is, and then go from there. And I did. I went and found a recipe from the Food Network website and I had a perfectly nice dinner made in no time! 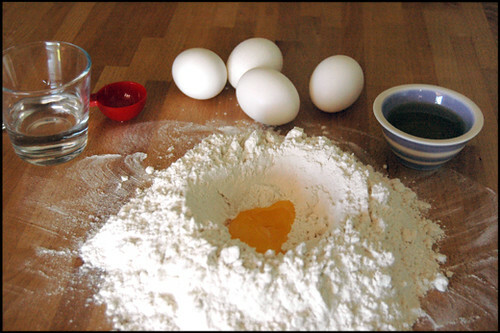 Make a little well out of the flour and add eggs to it, along with oil, water and salt. 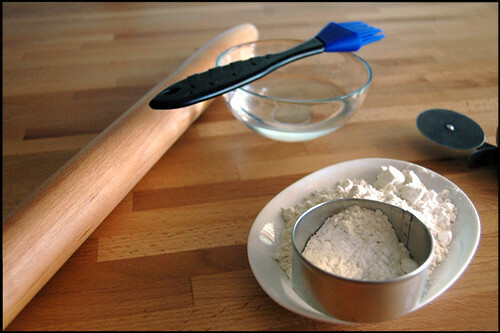 Using a fork, mix together the egg, water and oil, and slowly start incorporating the flour from the sides to the wet mix. When enough of flour is added to the wet mass (so if you mixed it with hands it wouldn't leak)start kneading it. This will take about ten minutes or until you end up with a very smooth dough. While you are waiting for the dough to rest, make the filling. Cook spinach in a pot with boiling water. 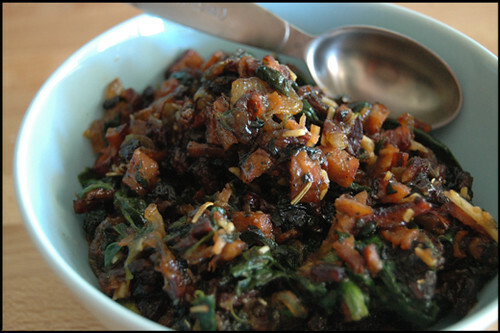 When the spinach is cooked, squeeze the excess water and chop it. In a pan, cook the pork with little salt and pepper. When it's cooked take it out of the pan and set aside. In the same pan, sauté onions that have been cut into little strips. You can add more oil if needed. Add a little bit of brown sugar too, it will help the onions get nicely caramelized. When they are done, mix them in with the pork. Add parmesan and mix again. 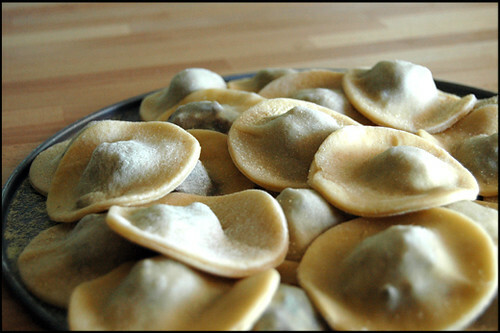 Cover the filling while you are making ravioli. When that is done, take a knife or a pizza cuter and cut the sides of the dough so it makes a rectangle. You want it do be wide and double the height of the desired ravioli size. The point is to spoon a T. of filling on the lower side of the rectangle, through the whole length every inch and a half or so. Once that is done, take a brush (or use your fingers) and sparingly brush it around the filling. This is our 'glue', what will hold the ravioli together so it doesn’t fall apart. Take the tops of the rectangle and cover the bottom of it. 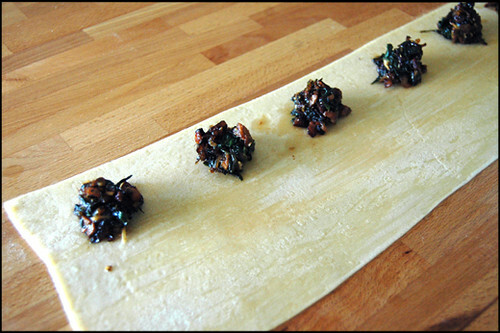 Use your fingers to seal the dough around the ravioli making sure to get rid of all the air pockets. This would also cause the ravioli to open when cooking. 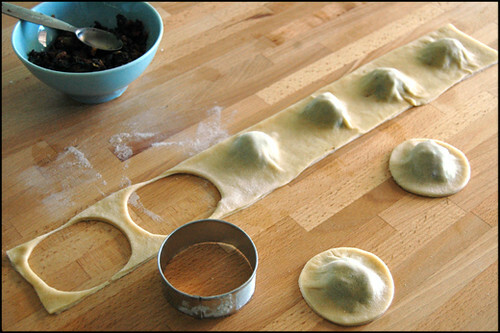 Cut out the ravioli with a cookie cutter, glass or pizza cutter, depending the shape you prefer best. Put them on a floured surface and cover with a dish rag. When you are ready to cook them, boil the water and add salt and oil to it. Fresh pasta needs less cooking time, just three to four minutes. While they are cooking, make the sauce. I decided on a very mild sauce because I wanted the star to be the ravioli itself - with their filling. I just melted some butter in a pan, added a little bit of chopped fresh tarragon and some parmesan cheese. 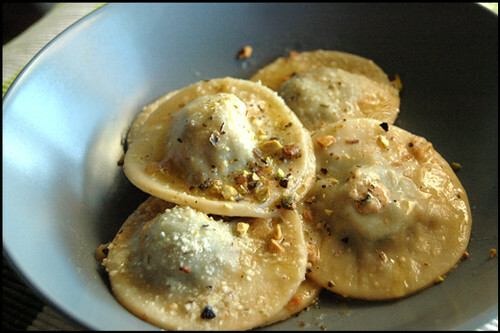 I added ravioli to it, and when I served them I garnished them with a bit of chopped pistachios. All this probably sounds a bit complicated, but it is not! I just make it look like that with my awful writing! :) It is fun and easy to make them and it's really special to make it on your own. It’s totally different than bought pasta. The best part is that you can play with the filling so much. Prosciutto, basil and mozzarella, or tuna with capers . . . Have fun with it . . . Conclusion to the ravioli making machine is that it is certainly not needed, but it would make the whole thing even easier. 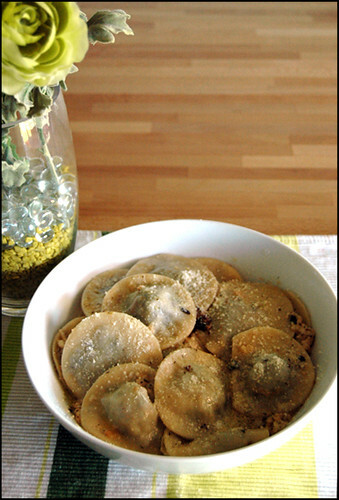 I will see if I will get the urge to make the ravioli often, so I wouldn't feel guilty about buying the machine!